A few weeks ago, we blogged about whether websites are “published” for copyright law purposes in Rogers v. BBB of Metropolitan Houston. While that decision lacked a definitive answer relating to the status of websites, it reinforced the long-standing idea that registering a copyright creates a presumption of validity that must be rebutted by the defendant. With their backs against the wall, the defendants in these copyright cases often try to challenge the validity of the copyright registration. But it’s not always clear what types of errors will invalidate the certificate and strip the holder’s right to sue. In Family Dollar Stores v. United Fabrics International, a district court in New York considered whether including previously published works in an “unpublished” collection invalidates the registration. United Fabrics International (UFI) is a textile company based in Los Angeles. In 2008, it purchased the rights to original artwork from a studio in Italy. 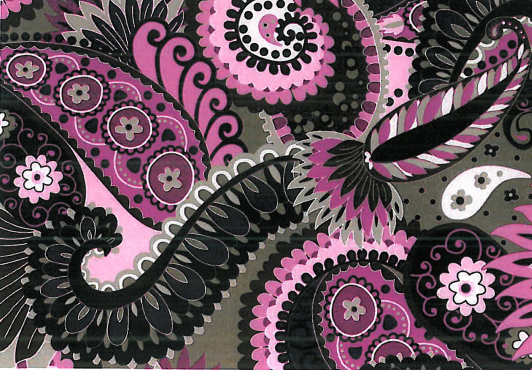 UFI used the artwork as source material to create a fabric design called “Mod Squad.” That same year, it began offering the design for sale to customers. Almost a year later, UFI filed an application with the Copyright Office to register the Mod Squad design and 18 other designs as a collection. The Copyright Office granted the application and issued a registration certificate for an unpublished collection, just as UFI had requested. By registering, the company gained the power to sue for infringement of its copyright rights for the design. UFI flexed this legal muscle in March 2011, when its lawyers contacted Family Dollar Stores and alleged that they had violated UFI’s registered copyright rights in the Mod Squad design. Since a registration certificate acts as prima facie evidence of validity, it was up to Family Dollar Stores to rebut that presumption and knock out the foundation of UFI’s claim. It turned out that they had an ace in the hole. When the Copyright Office granted UFI’s application, it didn’t know that UFI had already published 13 of the 19 designs in the purportedly “unpublished” collection. Family Dollar Stores jumped all over this inaccuracy, and filed a complaint for a declaration that UFI’s copyright rights are invalid and unenforceable. UFI filed counterclaims alleging infringement of the Mod Squad design copyright. The court agreed with Family Dollar Stores, and held that UFI’s copyright registration for the Mod Squad design was invalid. The chain of logic is fairly simple. Under 17 U.S.C. § 101, “The distribution of copies . . . of a work to the public by sale or other transfer of ownership” constitutes publication. Thus, UFI published the Mod Squad design by selling it and erred when it included the designs in the “unpublished” application. The question became whether this error would prove fatal to UFI’s counterclaims. In this regard, the court cited two cases left unanswered by UFI–Determined Productions, Inc. v. Koster and L.A. Printex Industries v. Aeropostale–which both held that prior publication invalidates registration as to the previously published designs. But in arriving at this same conclusion, the court considered whether the improper inclusion of the previously published materials amounted to a “material” error that could invalidate the registration certificate. UFI tried to argue that its inclusion of the Mod Squad design was a “minor technical” error. This distinction is significant because if it had been merely a technical error, Family Dollar Stores would have had to prove that UFI intended to defraud on the Copyright Office. Unfortunately for UFI, the court did not buy this argument. The decision recognizes that the “material error” vs. “technical error” distinction depends on the particular design at controversy. To better digest this point, it helps to break down the L.A. Printex case mentioned above. That case also involved a registered, unpublished collection of designs. But even though that collection included some previously published designs, the claim revolved around the properly included unpublished designs. Since UFI’s application contained a material error, the court invalidated its protection of the Mod Squad design, thus barring the textile company’s counterclaims. This should go without saying, but UFI’s management should have been more hands-on in making sure that its copyright application was completely accurate. As we saw in this case, courts can be sticklers about certain designations, and this ended up as a costly error for a design to which they actually had the rights. Any time you have to stand up in front of a judge and claim legal ignorance, you are already on shaky ground. This is essentially what happened; UFI tried to pass the buck and said that its design team made a good-faith legal mistake. Did they not think to consult legal counsel for these complicated intellectual property issues? Why did they leave the application process to the design team in the first place? But nobody’s perfect, which leads me to my second point. UFI could have and should have contacted the Copyright Office about a supplementary registration. By doing so, it could have accounted for its so-called “mistake,” and preserved its right to go after Family Dollar Stores on the Mod Squad design. But it dropped the ball and never even supplied the court with a supplementary registration. This is just plain sloppy and, judging from the tone of the decision, did not garner any favor with the judge. It’s still unclear how this result meshes with the Rogers v. BBB decision. The court in Rogers never definitively answered the question of whether a website is “published” for copyright law purposes–it acknowledged the unsettled nature of the question and merely held that BBB had not overcome the presumption of validity attained by the registration. But if future decisions show that websites are “published,” then the copyright holder should make sure their applications follow suit. Otherwise, this decision seems to suggest that they would be putting their rights at risk.